MIAMI — On Thursday, the Marlins traded All-Star catcher J.T. Realmuto to the Phillies for catcher Jorge Alfaro and pitching prospects Sixto Sanchez and Will Stewart. Even though the deal is final, Miami still could land another prospect as a result of the Realmuto trade. As part of the package, Philadelphia included $250,000 of international bonus pool money. The Marlins have until June 15, the end of the 2018-19 international signing period, to spend that money. There are examples of international signings late in the process who have panned out. Sanchez, a centerpiece in the Realmuto deal, is proof. The right-hander signed for $35,000 with the Phillies on Feb. 20, 2015, and he now is ranked by MLB Pipeline as the No. 21 prospect in baseball. Marlins president of baseball operations Michael Hill addressed the organization’s interest in signing international free agents on Monday as a guest on MLB Network’s Hot Stove show. “Something we’ve tried to do in all of our deals of late was [get] the international money,” Hill said. Those trades included sending reliever Kyle Barraclough to the Nationals for $1 million of international bonus money in October. That went toward Miami signing outfielders Victor Victor Mesa, for $5.25 million, and Victor Mesa Jr., for $1 million. Being aggressive in the international market is a priority of the ownership group led by Bruce Sherman and Derek Jeter. Previous ownership often traded away international money rather than compiling it. 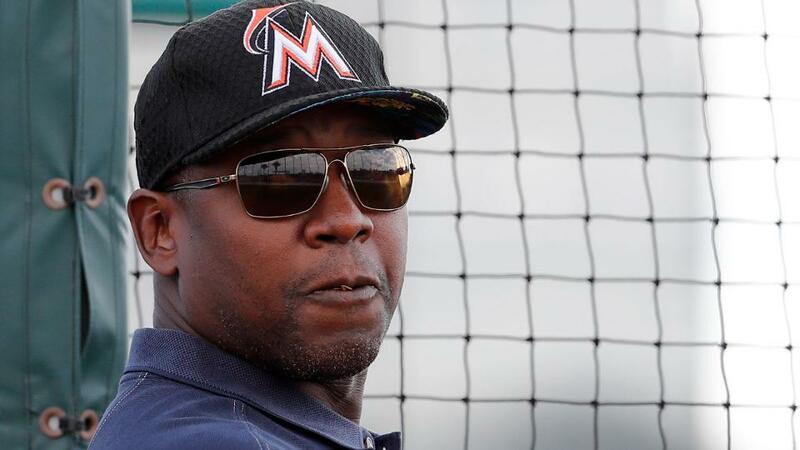 • Pitchers and catchers begin Spring Training workouts on Wednesday at the Roger Dean Chevrolet Stadium complex, but the Marlins may not be done adding players. Hill said during FanFest on Saturday that the team is open to signing a free-agent reliever. “A veteran bullpen piece,” Hill said. • Right-hander Austin Brice, claimed off waivers from the Orioles on Feb. 4, is a serious candidate to make the Opening Day roster as a reliever. Brice is a sinkerball pitcher who had a 52.6 percent groundball rate in 2018. After Miami traded Brad Ziegler to the D-backs at the July 31 non-waiver Trade Deadline, the club lacked a groundball-type reliever. Brice will get a chance to fill that role.